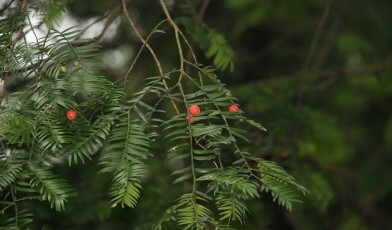 The Chinese Yew (Taxus chinensis) has undergone a dramatic population decrease of at least 50% since the 1990s, largely as a result of the discovery of the species’ medicinal properties; especially in the treatment of cancer. Whilst there are attempts to propagate this species to meet the demand, over-exploitation of wild plants is likely to continue. At the moment, the population in China is estimated to be around 800,000 individuals, of which there may be up to 80,000 mature trees scattered over a large area. In Vietnam, the population is known to be much smaller. The number of mature individuals is decreasing throughout its range and there is little regeneration due to the species’ slow growth rates and longevity (1,000+ years). In China, T. chinensis occurs in evergreen and deciduous broad-leaved forests, frequently along streams and often where the undergrowth is dominated by bamboo. In Vietnam, it occurs on the steep slopes of the northern limestone karst formations and on ridges in subtropical and tropical evergreen forest. It tends to be sporadic in its occurrence and doesn’t form dense stands across any part of its range. The wood is used in construction, cooperage (barrel making), furniture, as well as wood carving and turning. In Vietnam it is also used for irrigation paddles in rice fields. Extracts of many parts of the plant (roots, wood, bark and leaves) are used in traditional Chinese medicine, though in modern times it has been most heavily exploited for the production of anti-cancer drugs such as Taxol®. Logging and deforestation in Vietnam may have had a bigger impact there as populations are relatively small. Exploitation of its bark and foliage for chemical/medical purposes has caused this species to be listed on CITES Appendix II, banning all international trade of the plant. Harvesting can now only be done legally from specific plantations, and in China several of these plantations have now been established. Thomas, P., Li Na, and Christian, T. 2015. Taxus chinensis. Threatened Conifers of The World.(http://threatenedconifers.rbge.org.uk/taxa/details/988). Downloaded on 15 February 2016.